Risky Business – How to Spot & Deal with Alcohol-Drug Interactions – TAM Card® Nation in Vegas! Cold and flu season is upon us. Pharmacies and doctors’ offices alike are filled with people picking up antibiotic prescriptions and over-the-counter products to fight their symptoms. However, a cough or cold won’t always stop someone from going out with friends or family for dinner and drinks. 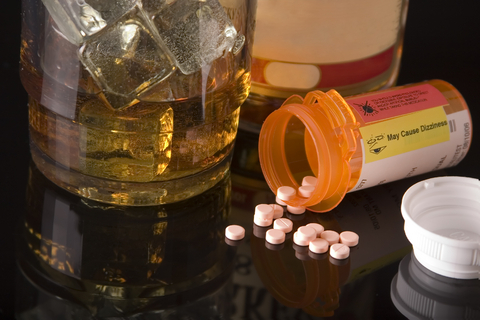 Unfortunately, mixing alcohol and medications can be harmful and dangerous. Complications caused by drinking-and-drug interactions sent 524,000 Americans to hospital emergency rooms in 2008 alone for treatment (View Source). As a server or bartender it’s not only important to be aware of the risks associated with mixing drugs and alcohol, but also how to spot this risky behavior in your bar and restaurant patrons. Medications used to treat allergies such as Benadryl and other antihistamines can cause drowsiness, clumsiness or lightheadedness. One should be aware that mixing antihistamines with a few drinks can greatly increase these effects and make it dangerous for driving and may cause the patron to show signs of intoxication much quicker, which could result in disturbances, undesirable behavior or fights. Over-the-counter (OTC) drugs aren’t the only drugs that can have risky interactions with alcohol. The same holds true for a multitude of prescription drugs including antibiotics, anticoagulants and antidepressants. Effects can range from headache and vomiting to lasting results such as liver damage and risk of overdose. As a bartender or server, there are a few easy steps you can take in your establishment to help protect against potentially disastrous outcomes associated with drug and alcohol interactions. Every medicine is different, and while only a doctor or pharmacist can definitively gauge the risks and possible interactions in any one individual, there are certain things you should watch for to spot any patrons who may be dangerously mixing medications and alcohol. If the patron is willing to engage in conversation, you could casually remind them that some cough and cold medicines can interact with alcohol, and that they should read the packaging on their medicine to check for any warnings. One example would be, “How is that Dayquil working for you? I might try that next time I get sick, does the packaging list any side effects to mixing it with alcohol? I sometimes have a glass or two of wine with dinner and like to make sure there is no risk in mixing the two.” This may spur the patron to think about how their own alcohol intake can be effected by their medication – sometimes a friendly reminder is all it takes. While every drug is different, warning labels on many common OTC medications indicate that side effects can occur if one ingests 2-3 alcoholic beverages a day with medicines. As such, watch your customers and keep track of any excessive drinking (in this case, more than one or two drinks) if you know or suspect they are mixing. You should encourage your customer to eat, bring them a glass of water with their alcoholic beverages, and maybe suggest a low or no-alcoholic beverage instead. If you suspect that your patron may have mixed medications to the point of concern or possible interaction, you should treat them just as you would with someone who has had too much to drink. Alert your manager or supervisor so that they can intervene if necessary. If your customer moves into the ‘danger zone’ and you need to stop alcohol service, remain calm and express concern for their safety when letting them know you need to cut them off. Alcohol and drug interactions are a risky business that can easily be avoided with a little bit of knowledge and forward thinking. Protect yourself by using common sense and reading labels the next time you drink, and share that message with those around you. What situations have caused you alcohol-drug interactions have you witnessed and how did you intervene? Previous Are You Concerned About Recent Rash of Casino Robberies? Pingback: A Growing Trend – Teens Drinking Hand Sanitizer | TAM® Nation in Vegas!